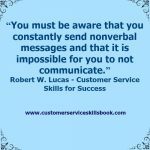 Effective nonverbal communication skills in customer service are the bedrock of understanding and customer satisfaction. This is especially true when dealing with people from different cultures. If you do not realize the power of the unspoken messages that you continually send with your body, you are likely destined for relationship breakdowns. This is because many research studies have identified nonverbal cues (body language) as being more powerful than spoken words. To compound the opportunity for misunderstandings, many cultures assign different meanings to similar gestures, postures and facial expressions. Being conscious of these nuances when dealing with someone from a culture other than your own can help in reducing the chance for communication failures. Following are areas of nonverbal communication to consider whenever you are in the presence of either your internal or external customers. Smiling. Researchers have known for years that smiling is one of the few gestures that universally send a positive message of friendship and indicate that you are approachable. As a service provider, you should go out of your way to consciously offer a genuine smile, along with an appropriate greeting when interacting with customers. People form first impressions about you and your organization within seconds of coming into contact face-to-face or over the phone. Ask yourself, “What image do I project in dealing with my customers?” For example, do you sit or stand behind a desk or counter and wait for the customer to approach and open dialogue. Or, do you get up or move toward your customer with a smile, handshake or other proactive gesture while verbally welcoming them. Whenever possible, do the latter since this projects an image of equality and willingness to do your part to assist the customer. Similarly, on the telephone, sit or stand up straight and ensure there is nothing in your mouth (e.g. food, drink or gum) when speaking. Otherwise, your words can sound muffled or unclear. Also, make sure that you smile regularly because the tone of your voice can project an upbeat attitude. Related to active posture, failing to stand up from behind a desk when approached by a customer might be viewed as a closed or rude behavior. Some might even view you as acting in a superior manner. This is certainly not a path to positive customer service and customer satisfaction. If you reflect back to your own past experiences, you have likely encountered this behavior at government or utilities offices (i.e. tax office, vehicle registration/licensing agency, law enforcement agencies, or water/electric company) or reception desks in organizations (i.e. banks, gyms, auto repair facilities, or medical/dental offices) where there is typically a large volume of customer traffic. Did you feel welcomed and served, or simply “processed” similar to how cattle moving into a slaughter house might feel? Positive gestures. Studies have found that people react differently to various types of gestures. To prevent potential misunderstandings or incorrect interpretations of your intended meaning, consciously think before you act. For example, some people prefer not to be touched or use different greeting gestures (i.e. traditional palm-to-palm handshake, hug, kiss on cheek[s]) based on their gender, culture, background or personality. Similarly, the manner in which one crosses his or her legs when seated can differ. The easiest way to help ensure that you exhibit positive nonverbal communication skills in customer service is to study the topic. Once you have the knowledge of appropriate gestures to use in various situations and with people of different backgrounds, you will be on your way to enhancing customer satisfaction. Just remember that you should never stereotype your customers. All members of a given group may not share the same values, beliefs and preferences based on their individual backgrounds. Pay attention to customer reactions when you interact and modify your behavior as required. For additional ideas on the topic of using effective nonverbal communication skills in customer service, search that topic on this blog. Also, check out Customer Service Skills for Success and Please Every Customer: Delivering Stellar Customer Service Across Cultures. What advice can you offer others related to developing positive nonverbal communication skills in customer service? This entry was posted in communication skills, Customer communication, nonverbal communication and tagged customer service skills, nonverbal communication skills in customer service, using nonverbal communication in customer service. Bookmark the permalink.